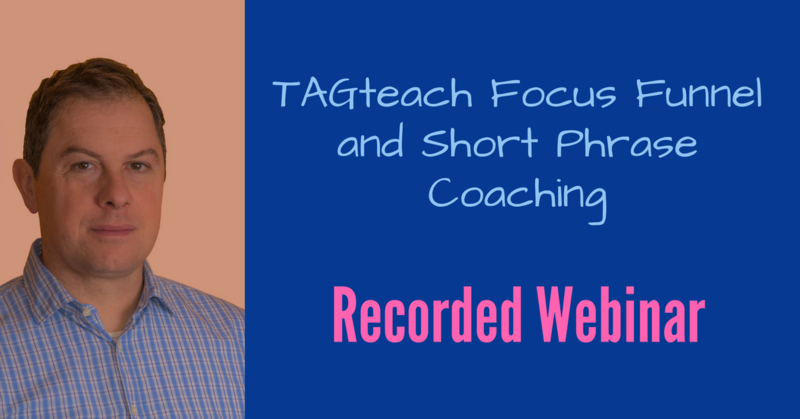 This webinar presented by Joan Orr (hosted by Theresa McKeon) provides an introduction to a key strategy useful to all TAGteachers. This topic will also be of interest to animal trainers since it is equally applicable to animal training. Why is it useful and effective? We will consider video examples of both complex and simple back chains. Read this brief article for an introduction to back chaining and to view two short video examples. 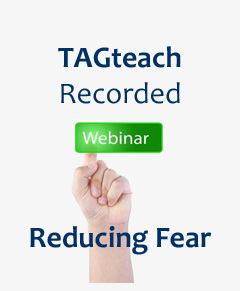 This webinar hosted by Joan Orr (with Theresa McKeon) discusses strategies for reducing fear in both children and adults. Numerous video examples are included. We talk about how to define tag points and implement them in order to allow the desired behavior to occur in fear-inducing situations. After you register you will receive an email right away with a link to watch the webinar. The webinar is recorded and the recording is available for members for $9.97. The recording will be available for purchase for non-members for $19.97. Can you tell a client or student how to improve in 5 words or less? DO you know what your Information Overload Triggers are? This webinar covers the topic of preventing information overload and how to make sure that you are giving your learners the most pertinent information. 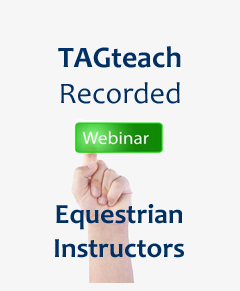 This webinar assumes a prior understanding of TAGteach. Do you see promise and potential in your students, but wish they would progress faster? 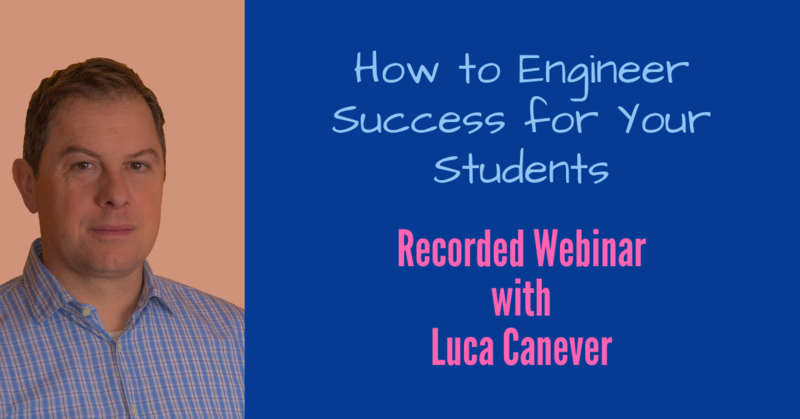 This webinar will show you how to boost your student's performance. You'll learn how to make simple changes to your teaching approach. You'll learn how to talk less, say more and motivate your students to do their very best. You'll learn about a powerful new approach to giving structured, perfectly timed positive reinforcement. This is a practical webinar that will show you exactly how to use TAGteach. TAGteach is teaching method that uses the principles of behavior science for precise, efficient, effective teaching. Elite orthopedic surgeons are trained this way as reported in Scientific American. Your students will be thrilled to know that they are being taught like surgeons! Raise the bar for your teaching and for your student's performance. In this webinar you'll see creative ideas for removing the horse (and his stress) from the picture and using just a few minutes on the ground before the lesson to minimize unnecessary errors. This webinar includes discussion and commentary from TAGteach cofounders Theresa McKeon, Joan Orr and Karen Pryor. You'll be able to put these new teaching ideas into practice in your very next lesson. This webinar comes with a 30 day money back guarantee, so if you don't see positive results, we'll give you a refund. This is a simple skill with a set of tag points that would apply to most riders. Learn how to teach this without the horse, so he doesn't have to tolerate lots of bad mounts. Watch the free snippet below to see how this works. This is edited. There is lots more in the full version. Do you find it tough sometimes to teach a concept (as opposed to a clear cut physical skill)?. You'll learn about the thought process you need to adopt to use TAGteach to teach thinking skills. You'll see this in an example of how to teach the concept of riding a 20 meter circle. You know how even the best planned lesson sometimes goes wrong? A student does something completely unexpected that throws your planning right out the window. You'll learn how to diagnose and fix those problems. You'll learn how to set new goals on the fly, get the student on the right track and give positive reinforcement at the exact right moment to cement that new learning. Here's the problem: The horse is drifting into the inside of the 20 m circle. The rider raises her right shoulder, her left side collapses, putting more weight on her inside seat bone, which causes the horse go further to the inside the circle- exactly opposite of what she wanted. TAGteach to the rescue! You'll see how Jane fixes this problem in a few minutes with almost no talking and no corrections for the student. This webinar is an hour long and is packed with practical how-to information. Jane Jackson is a Level 2 TAGteacher with many years of experience training horses and teaching riders both children and adults. Jane shares some of her insights and techniques for using TAGteach to help make learning more fun and efficient. Not ready to spend $20? Read this article with more free information from Jane. Abigail Curtis DVM and Karin Coyne are Level 2 TAGteachers. They are the founders and co-directors of The Ohio 4-H Teen Dog Experience, an overnight dog camp for teenage 4-Hers and their dogs that utilizes science based dog training in a supportive environment to develop and practice teaching and leadership skills. They have been using the principles of TAGteach for over 5 years at camp. 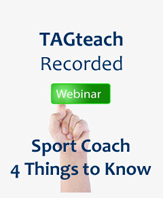 Webinar Recording - Sport Coaches: Four Things Your Athletes Wished You Knew! 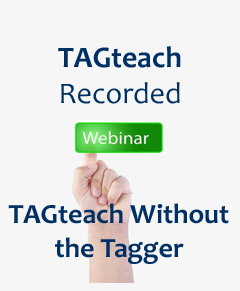 In this webinar TAGteach cofounder Theresa McKeon talks about ways to use the principles of TAGteach in situations where it is not possible or not desirable to use an audible tag to mark behavior. Free for members until May 12, 2014 and after that the member price will be for $9.97. 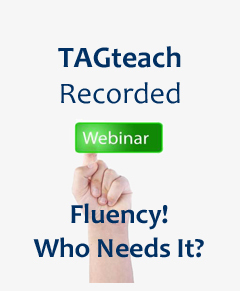 TAGteach Recorded Webinar: Fluency - Who Needs It? Recorded Webinar: Fluency - Who Needs It? Luca Canever is a Level 3 TAGteacher, with lots of experience applying TAGteach and teaching others. Luca is a scientist with a keen interest in the brain and how it learns. He will expand on his topic of a previous webinar on How the Brain Learns, to talk about fluency, what it is, why high level performance depends on it and how TAGteach fits with the scientific findings on fluency. How do we achieve fluency? How TAGteach fits with the theoretical basis for fluency now being described by scientists? Don't be surprised if the Mona Lisa makes another appearance! Click here to view snippets from this webinar. Click here to read an article by Luca on the topic of fluency. Marissa has extensive experience developing training programs for animal shelter volunteers. 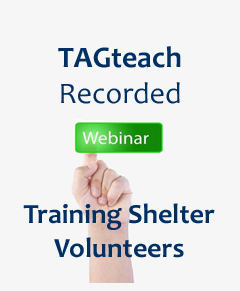 In this webinar she will explain her successful strategies for applying TAGteach to volunteer training. You will learn how to create powerful and effective lessons that develop not only hands-on skills, but empower the volunteers to make smart decisions. How to teach safe animal handling skills to new volunteers using TAGteach. How to teach volunteers patience and observation skills when meeting new shelter animals to promote safety and develop trust between the animal and the volunteer. Click here to read more about Marissa. BONUS #2! When you register for this webinar recording you will receive a discount code for 25% off our recorded webinar: Leave it! Impulse Control for the Teacher with TAGteach cofounder Theresa McKeon, since this is a great complement to this webinar for training shelter volunteers. Emelie is a Level 3 TAGteacher, and experienced parent. Emelie and her husband, Anders, are raising three kids with TAGteach. Their goals are to raise happy competent individuals who will go out an make the world a better place. Their family is happy, interesting and content. 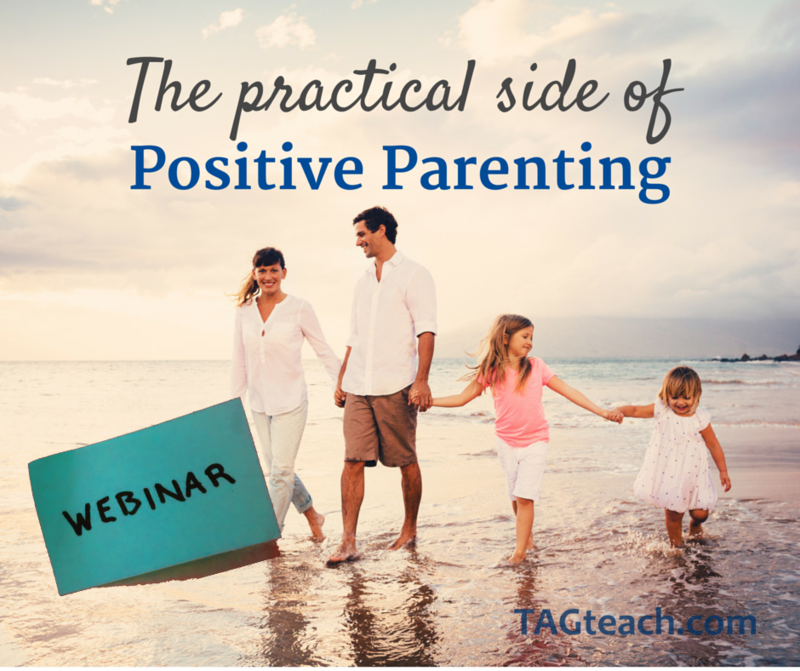 You've heard lots about positive parenting. It sounds great and of course most parents aspire to this. The trouble is, that there is not a lot of advice about exactly how to go about being a positive parent. Does this mean saying "yes sweetie" all the time and raising spoiled, entitled kids? How can you stick to your ideals when the kids are on their worst behavior? The recording is available for members for $9.97. The recording is available for purchase for non-members for $19.97. Luca holds a Bachelor’s degree In Archaeology from Padova University. He is currently working across several fields: level 3 TAGteacher, school teacher, archeologist, and professional dog trainer. His experience with TAGteach is widespread and includes; sports training (developing TAGteach procedures for Olympic Archery); writing skills, safety procedures, and management in the school classroom; teaching people to train the pets; and as the father of a wonderful son, Alessandro, he is refining TAGteach as a positive reinforcement tool in parenting. Luca has worked to obtain his position on the TAGteach Faculty and has hosted many TAGteach seminars and projects in universities, classrooms and regional events. The member price is $9.97. The non-member price is $19.97. In this free Q&A session you'll get answers to questions commonly asked by parents and professionals just like yourself who want to get started with TAGteach. How can I set up a WOOF plan to address a behavior? Will I have to tag and treat forever? What TAGteach resources are available to help people get started? How can I use TAGteach with a child at the severe end of the spectrum? How can I use TAGteach with speech and language issues? How can I use TAGteach in the classroom? This is a half-hour-long Q&A with questions from parents and experts. You'll get great answers to specific questions and you'll come away with lots to think about and implement right away in your own teaching. This Q&A is the first in a series that are free for anyone registered in the TAGteach for Autism online course. Look inside the course for the link to join. This Q&A is free for anyone registered in the TAGteach for Autism online course. Look inside the course for the link to access the recorded Q&As. Have you wondered how to apply TAGteach in a group sports setting with special needs kids? Will it be too noisy for the learner to hear the tags? Will the learner be too distracted by everything else going on the room? How do you handle the reinforcers? Can you use TAGteach to manage behavior and social issues? Do coaches really think that kids taught with TAGteach learn better? Listen to this month's interview with a TAGteacher and watch the accompanying videos to get answers to these and more questions. 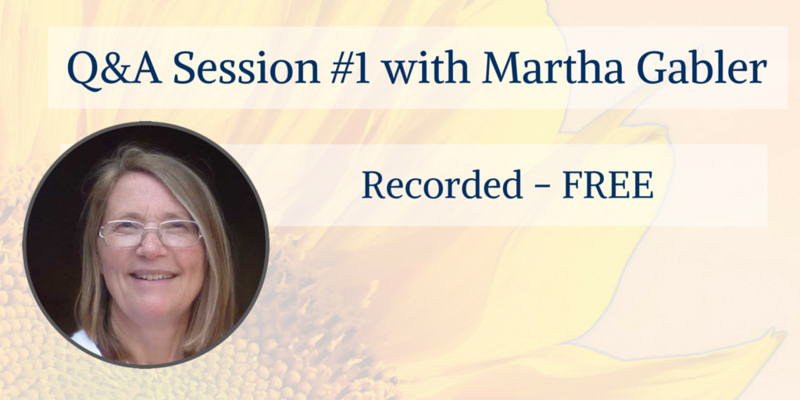 This month, Martha Gabler interviewed with Joey Iversen. Joey is a Level 2 TAGteacher with extensive experience from both ends of the tagger. Joey has trained several tennis coaches to use TAGteach with her instruction, because she wants to learn in the most efficient way possible. Joey has been working with a special needs tennis program and has successfully integrated TAGteach into the teaching protocols. Following the interview there is more fascinating discussion with Joey about the specifics of TAGteach application in the special needs tennis program and the benefits observed. 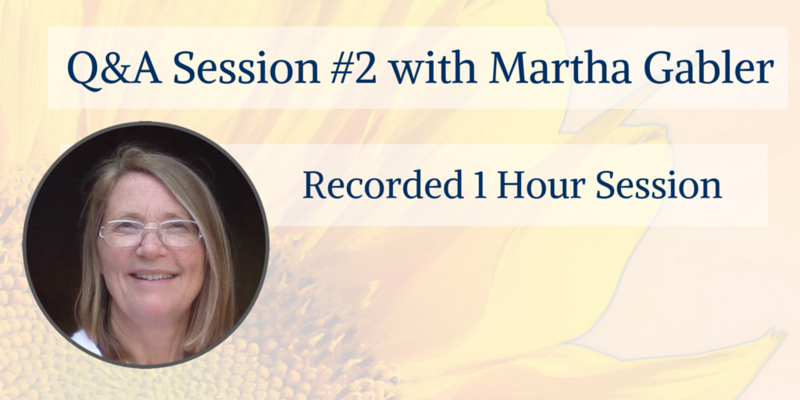 We also discussed ways to apply TAGteach and how Martha applied it with her son. Learn from an Occupational Therapist how to apply TAGteach to instruction on letter formation. You'll be fascinated by the tips and tricks that a school-based OT uses to teach a third grader to print letters properly. Join us for this month's Q&A for more answers to questions from parents and professionals and our feature Interview with a TAGteacher. 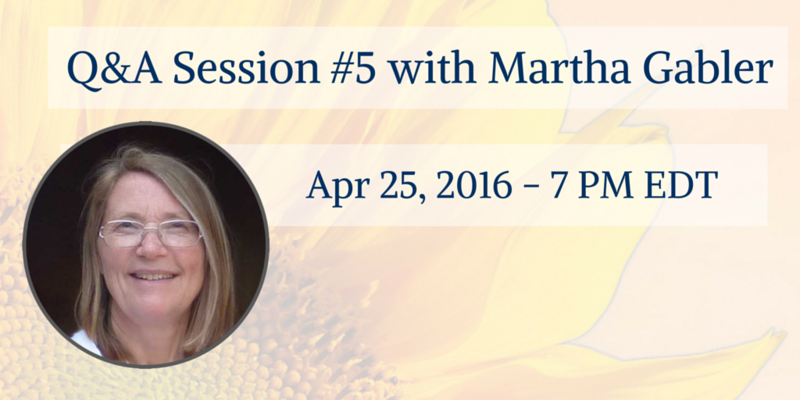 This month, Martha Gabler interviewed Mary Handley. Mary is a Primary Level TAGteacher and a very experienced School Occupational Therapist. Mary has been documenting her progress with teaching a 3rd grader to print. This child was never taught to print in a systematic way and as a result his printing is so poor that it is affecting his grades and his confidence. 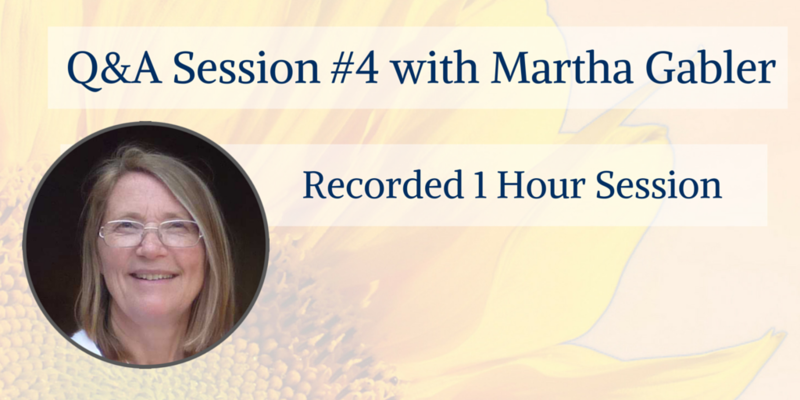 Mary will share her successes and challenges with using TAGteach for printing and you'll see some never before seen TAGteach video. What were some of the challenges with using TAGteach and how did you overcome them? Following the interview there is more fascinating discussion with Mary about the specifics of TAGteach application in school-based occupational therapy. This session is free for anyone enrolled in the TAGteach for Autism online course. 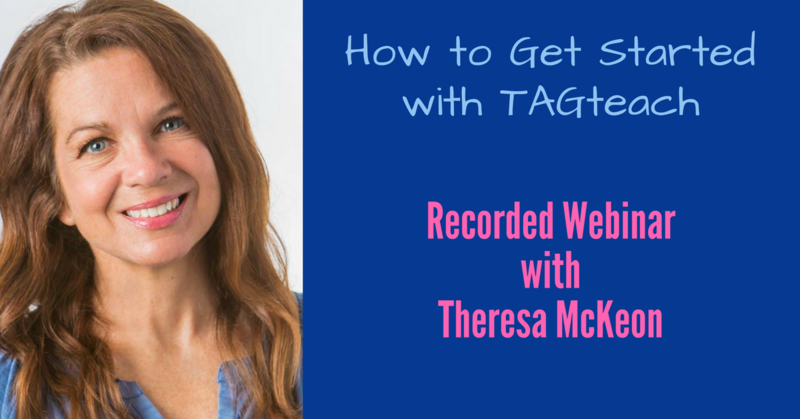 Watch or listen to this recorded webinar with TAGteach co-founder Theresa McKeon for her best tips on how to get started with TAGteach. You'll learn how to hit the ground running with the powerful TAGteach approach whether your learners are tiny tots or adults in a high pressure work environment. You'll learn about how we've introduced TAGteach to different ages and types of learners. We'll share our games and activities that we use to get started. 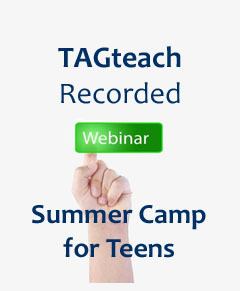 We'll show you some videos of some first time TAGteach sessions. Have you ever found yourself talking too much and confusing your learners (or your kids if you're a parent)? The key to getting learners to do it right the first time so that you can reinforce this correct behavior, is to pare down your language to the key details. In this webinar Luca will explain how to take individual tag points and put them together into more complex skills. You'll learn how to use short phrase coaching to help your learners put skills together into behavior chains. You'll learn how to coach you learners to remember and accurately execute behavior chains with multiple steps. The Focus Funnel: what it is and how it works to generate a tag point. How to generate short phrases for coaching and self-coaching. How to incorporate tag points into instructions for maximum learner comprehension. How to build skills from behavioral elements. How to determine whether additional tag points are required to solve problems. How to use Short Phrase Coaching during learner practicing. Luca is a fabulous teacher. You will learn as much from his content as you will from observing the way he teaches. Luca is one of our most experienced TAGteachers. He's used TAGteach in many applications including sports, classroom teaching, special needs classroom teaching and parenting. Luca is pioneer in the field of TAGteach plus Precision Teaching and is always striving to improve our teaching methods. Once you register you will receive an email from us within a few minutes with the recording link information. Please check your junk/spam email folders if you don't see it in your main email inbox. If you're using gmail, please check the promotions and social tabs. If you don't receive the email please send a message to joan@tagteach.com. Do you want to take your teaching to the next level and really know for sure what's working and what needs improvement? Have you ever tried something that you're sure would work, only to have lackluster performance from your learner? The way to know for sure that you're learners are progressing is to take DATA. And not any old data. You have to do it right. Join us for this webinar and learn how to take data in an easy way that gives you true insight into learning progress. TAGteach is a methodology based on the science of behavior. After we have tested and implemented TAGteach in many different applications, we are now realizing that we need to have data to support our teaching plans. In other words we need scientific evidence. Skinner used a cumulative recording strategy that O.G. Lindsley developed this laboratory tool in Precision Teaching: a tool that also first graders can use to self assess their improvement. Yes, if a first grader can do it, you can too! 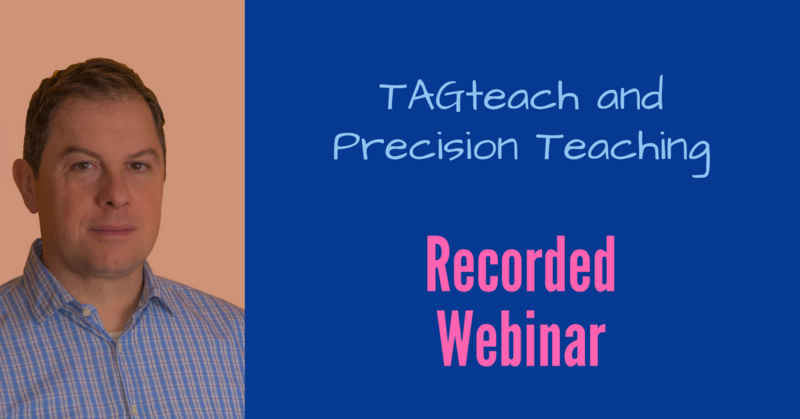 This webinar will focus on how combining TAGteach with Precision Teaching can be one of the most powerful combination of tools for every teacher. 2. What is Precision Teaching? 3. What does Precision Teaching record? 4. The Standard Celeration Chart: what it is and how it works . 6. Combining TAGteach and Precision Teaching (the difference and similarities between tag points and Pinpoints). As brand new TAGteacher I was worried sick about reinforcers. What I could use in my class? With my son? With my clients? As my experience was building up, I've discovered that Success was the greatest reinforcer. I’ve started to think about that when I started my archery practice. My coach was tagging me and I was happy with results: I didn’t need candies or other tangible reinforcers to keep practicing (Which I'm still doing after 4 years). Three years ago I’ve started to work in special education and to my surprise my students with “great disabilities" preferred success and good instructions to stickers. Finally I prepared a TAGteach presentation with my son Alessandro. He has been my first tag learner and the main reason I’ve got involved with TAGteach in the first place. Working with him, I’ve discovered that Alessandro shares a great knowledge about learning with TAGteach and the importance of Success as reinforcer. Luca is a long-time member of the TAGteach Faculty. Luca holds a Bachelor’s degree In Archaeology from Padova University. He has worked across several fields: TAGteacher, school teacher, special needs school teacher, archaeologist, and professional dog trainer. His experience with TAGteach is widespread and includes; sports training (developing TAGteach procedures for Olympic Archery); writing skills, safety procedures, and management in the school classroom; teaching people to train the pets; and as the father of a wonderful son, Alessandro, he is refining TAGteach as a positive reinforcement tool in parenting. Luca has presented many TAGteach seminars and webinars in universities, classrooms and regional events. 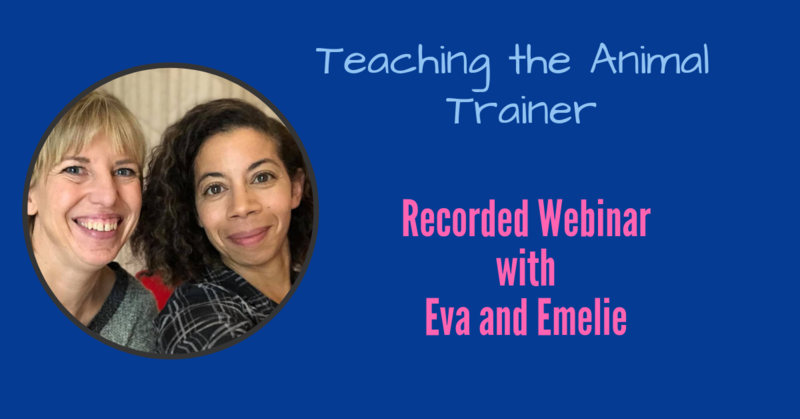 In this webinar the Scandinavian duo Eva and Emelie (Carpe Momentum) delve into teaching people teaching animals! To develop competent, confident and creative animal trainers, we need to be as good teachers for the human part of the team as for the non-human part. Being a good teacher means includes goals and goal setting, how to set up for success, how to develop independence and how to work with groups, as well as building vital trainer skills such as mechanics, planning and more. 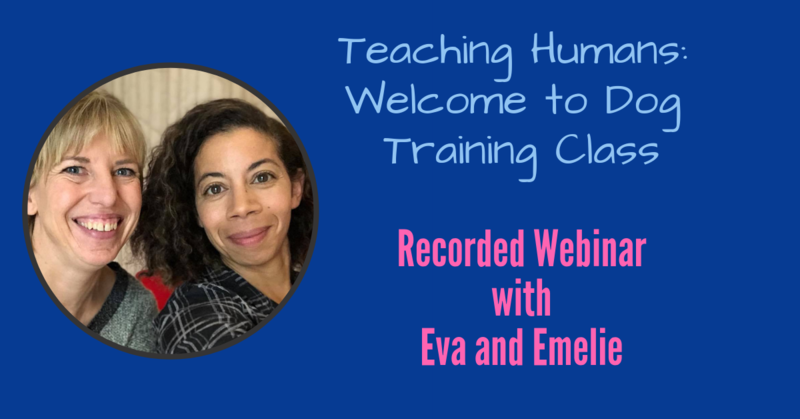 Whether you teach group lessons, give private lessons, train with friends or work on your own, this webinar will help you set up for successful learning for the human side of animal training. This is Part 1 of a two part series. Click here for more info on Part 2.